and that is what they give back ten-fold. Originally they were the lap dogs of royalty, which is why they are called "comfort spaniels". They want to be with their family and they are lonely without them. This is not a breed you can leave outside all day or leave indoors in a crate all day while you are at work. If you do not want a dog who follows you all around the house and wants to sit in your lap when you watch TV or read, than this breed is not for you. 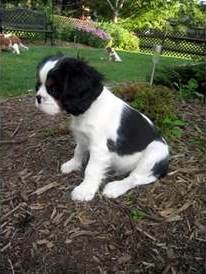 Cavaliers only eat a half cup of food a day so it makes feeding them a high quality food affordable. Any dog food off the Top 10 Natural Dog Food List is generally a safe choice. I feed "Taste of the Wild" and Fromm. Here are some other recommendations: Orijen and Acana. Cavaliers are not cold weather dogs, they must be kept from cold drafty environments. They prefer the warmth of your lap or a soft cuddly dog bed when you aren't there. When we have to leave our dogs they are in the house with a dog door into a safe fenced enclosure so they can relieve themselves and get fresh air. Grooming a Cavalier is so much easier than our previous breed, the Samoyed, who took 2-3 hours to dry with a high powered professional dog dryer. 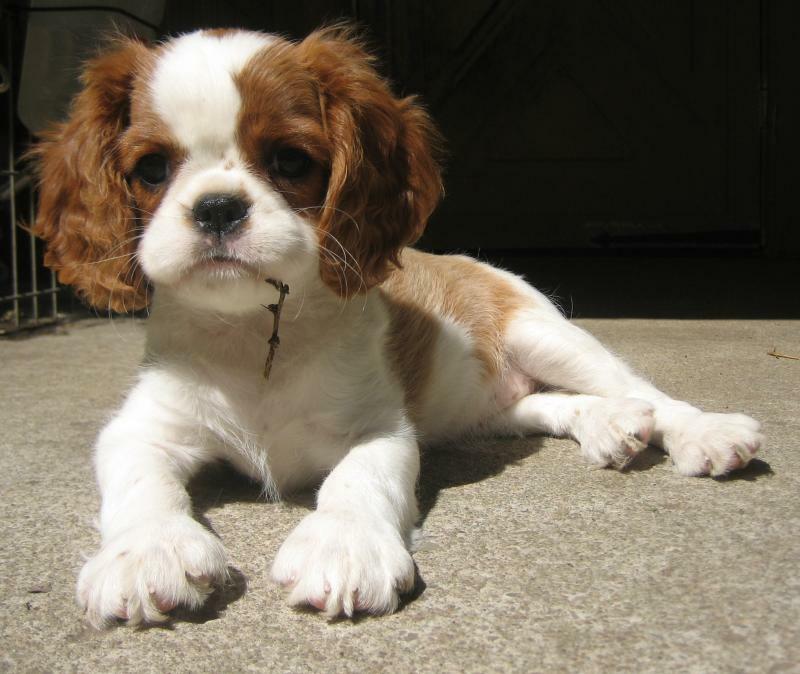 Ears are the trickiest part of the Cavalier as they tend to get in their food and water and in each others' mouths when they play. So a good weekly ear combing is important before they get matted. I find the cavalier easy to bathe. I start bathing them when they are 8 weeks old and continue to bath them every month and I have no trouble with shedding. I use our laundry room sink which is at a nice height and perfect size with a removable shower head on a hose to wet them down in a matter of minutes. Then I use a gentle tear-free childrens' shampoo and message it in followed by a thorough rinse. I let them shake before removing them from the tub. Then I wrap them up in towel and towel dry them. Last, I use a commercial dog dryer and dry them in 10 minutes or less. Socializing your puppy is easy, fun and vital to your puppy becoming a confident, outgoing well-rounded canine citizen. It is important, however, to stay away from public parks until your puppy has received its complete set of puppy vaccines. I recommend a puppy kindergarten class which is a way of socializing puppies with other puppies and people in a very safe, friendly environment where all puppies have to show proof of vaccines to be there. After puppy kindergarten, a beginner's obedience class is also beneficial. This is where your dog will learn the basics like walking on lead, sitting, standing, lying down, and coming to you when called. There are many good affordable classes though your local community centers. After your puppy receives the full set of puppy vaccines at 8, 12, and 16 week with rabies, then your he/she will be set for the next year.